Temperature : Max. 41.1°C and Min. 26.6° C in Summer.Max. 29° C and Min. 9.1 ° C in winter. Clothing : Cotton in summerWoollen in winter. Best Season : October to April. ‘Prayag’ or ‘Allahabad’ as it is known today is one of the most sacred pilgrimage centers of India. The present city of Allahabad was founded by the Mughal emperor Akbar in 1575 A.D. Realizing its strategic importance as a waterway landmark in north India; Akbar built a magnificent fort on the banks of the holy ‘Sangam’. Every 12th year during the months of Jan-Feb world famous Kumbha Mela is held here on the banks of the holy sangam. Ardha Kumbha Mela is held every 6th year. The Magha Mela is the annual version of the Kumbh and Ardh Kumbh mela, which starts every year in January and ends in February. 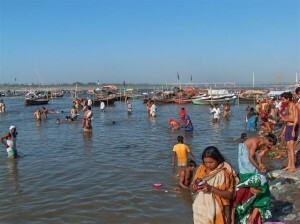 Among important pilgrim points are the Sangam, the sacred confluence of three of the holiest rivers. Patalpuri Temple, Akshayavat the immortal tree within the Patalpuri Temple, Kalyani Devi temple, Hanuman Temple, Shankar Viman Mandapam, Mankameshwar Temple, Beni Madhav Temple, Bharadwaj Ashram, Alopi Devi Temple, Hanumat Nikean, Shivkoti Nepali Temple and Nagvasuki Temple. Some other interesting excursions from Allahabad are Jhoonsi-Pratishthanpuri (9 km), Shringverpur (40 km), Kaushambi (60 km), Arail (11 km), Sujavandev, Imilien Devi temple, Padila Mahadev, Durwasa Ashram (18 km), Aindri Devi temple, Vindhyachal (93 km), Varanasi (125 km), Bhita (20 km), Upardha Lake (44 km), Garhwa (55 km), Pabosa (62 km), and Vindhyachal (93 km). Luxury and budget class hotels are available for accommodation as well as Tourist Bungalow. Air: There is no flight for Allahabad at the moment. Nearest airportare Varanasi, Lucknow and Kanpur. Rail: Allahabad is a major railway junction on Northern Railwayand is connected to all parts of the country by express trains. Road: On National Highway No. 2 and 27, Allahabad is connectedto all parts of the country with good roads. making the water truly magical. The place comes alive, during the Kumbh Mela and the Ardh Kumbh, attracting millions of devotees from all across the country. The Sangam is the site for important fair and festivals, the year round. Allahabad Fort: The lofty Allahabad fort, built by Emperor Akbar stands close to the Sangam. It can be best appreciated from boats on the river. Much of the fort remains in military occupation, public access is restricted to the corner around the Patalpuri temple and the ‘Akshayavata’ or the undying tree. At the main gate of the fort stands the restored polished stone Ashokan Pillar dating back to 232 B.C. The 10.6 mts. high pillar has several edicts recorded on it along with the Persian inscription by Emperor Jahangir, at the occasion of its accession to the throne. Patalpuri Temple: The underground temple, inside the fort, with the Akshayavat or immortal tree is said to have been visited by Lord Rama. Hanuman Temple: The Hanuman Temple also near the Sangam, houses the largest unique reclining image of Lord Hanuman. It is believed that the river rises during the annual flood to touch the feet of the image before receding back. Shankar Viman Mandapam: This is a 130 ft. high structure with four floors, an idols of Kumari Bhatt, Jagat Guru Shankarchariya, Kamakshi Devi, Tirupatti Balagi (with 108 Vishnus) Yogashastra Shastrayoga Linga (having 108 Shivas) adorn the interior. Minto Park (Madam Mohan Malviya Park): Near Saraswati Ghat is the Minto Park. A stone memorial with four – lion symbol on top, the foundation of which was laid by Lord Minto in 1910 stands here. Khusru Bagh: Khusru Bagh is a walled garden where remains of Prince Khusro, the eldest son of Jahangir, lie buried in a simple sandstone mausoleum. Anand Bhawan: Several history-making event of the freedom struggle took place here. Today, this ancestral home of the Nehru Family, houses a Museum displaying the memorabilia of the family. Visiting time of this place is 9:30 a.m. to 5:00 p.m., closed on Monday and Govt. holidays. Swaraj Bhawan: This is the old Anand Bhawan, which in 1930, was donated to the Nation by Moti Lal Nehru. He also renamed it Swaraj Bhawan. Open 9:30 a.m. to 1:00 p.m. and 2:00 p.m. to 5:30 p.m. It is closed on Monday. Jawahar Planetarium: Celestial trips of the scientific kind merit a visit to the planetarium. It’s worth every monument. It is open at 11:00 a.m. to 4:00 p.m. It is closed on Mondays and the 4th Thursday of every month. All Saints Cathedral: Described as the finest Anglican Cathedral in Asia, following the 13th century Gothic style, the All Saints Cathedral is a remarkable example of colonial architecture in India. Designed by Sir William Emerson, architect of Victoria Memorial, Kolkata and the cathedral still remains much of its stained glass work and its impressive marble alter. Beni Madhav Temple: An old Lakshmi Narain Temple in Daragang locality, where Chaitanya Mahaprabhu is believed to have paid his homage. Allahabad Museum: It is located at the edge of Chandrasekhar Azad Park. The museum has excellent collection of sculptures and terracotta artifacts. Material excavated from Kaushambi site can also be seen here. Modern art collection includes works by Halder, Sajit Khastgir,Jamini Roy, Nicholas, Roerich and pieces of thanka work by Tibetan Lama Angarika Govinda. Opened daily between 10:00 a.m. to 5:00 p.m. Weekly holiday is Monday. Public Library: Standing at Alfred Park this building was opened as a memorial to the friendship of Lord Thornhill, the then Commissioner of Allahabad andMr. Mayne, the then Collector. It was called the “Thornhill and Mayne Memorial”. This library is a remarkable example of Gothic Style. The memorial has lofty tower and arcaded cloisters. It has about 75,000 books, besides it a treasure prove of manuscripts and journal. The Old High Court and Public Offices: The Old High Court and Public Offices are four two storeyed blocks. Made of sandstones and ashlar these were built by Colonel Piele in 1870 in the classical style. The Minto Park to the west of the fort has a memorial pillar enriched with royal medallions and four lions carrying the Immaterial Coronet. The Municipal Museum: The Municipal Museum adjoining the Library is yet another Colonial structure, which is a treasure trove of archaeological artifacts. Muir College: Muir College is an excellent mix of Gothic and Indian architectural elements. It has an arcaded quadrangle, which is dominated by a 200 ft. minaret towerin cream coloured sandstone with marble and mosaic floors. The domes of the Indo-Saracenic structure are clad in Multan glazed styles. Mayo Memorial Hall: It is situated near the Thornhill and Mayne Memorial. R. Roskell Bayne designed this large hall with a 180 ft. high tower. The interior of this memorial hall is ornamented with designed by Professor Gamble of the south Kensington Museum, London. This hall was meant for public meeting, balls and receptions in commemoration of the assassinated Viceroy. Holy Trinity Church: The Holy Trinity Church is a fine composition based on Gibb’s prototype of St. Martin-in-the-Fields, London with interesting tablets from the Gwalior campaign of 1843 and the 1857 mutiny. The church was consecrated by Bishop David Wilson on 19th February of 1841 and named The Holy Trinity Church. The Jamuna Church: This church was built in 1847, is yet another example of colonial architectural styles prevalent in the first quarter of the 19th century. Saint Peter’s Church: Saint Peter’s Church, Muirabad was completed in 1874 with the compensation money received after the 1857 uprising. Kumbh Mela: Kumbh Mela is held every 12 years on the banks of Sangam, the Kumbh Melas draws devout Hindus from across the globe. Saints, pilgrims, believers and commoners alike attend it. A dip into the scared waters and offerings to the Sun God are believed to clean the soul sheer religious fervour and deep abiding faith lend and incomparable air to the fair. In effect the Kumbhattracts millions who congregate on the banks of the Sangam and bring alive a temporary township. Ardh Kumbh Mela: Second only to the Kumbh in sanctity, the Ardh Kumbh is celebrated every 6 years on the banks of the Sangam. Millions of devotees, from around the world come to attain this festival. Magh Mela: It is the annual version of the Kumbh Mela, held in all years other than those of Kumbh and Ardh Kumbh. Dussehra: This celebration is unique in Allahabad. In the evening and at night, beautifully decorated “Chowkis”, (tableaus) starts from different localities,displaying scenes from Indian mythology. Each “Chowkis” is tastefully decorated. A sense of pride and spirit of competition brings forth the most beautiful “Chowkis”. Jhunsi: Jhunsi is the city of old Pratisthanpur, 9 km across Ganga. Places of interest include Shiv Temple, Samudra Koop and the Hans Tirth Temple. Access byroad and boat. Arail: Arail is a religious centre with many temples, which is situated 11 km across Yamuna River. Accessible by both road and boat. Shringverpur: Shringverpur is situated 40 km from Allahabad. The kingdom of Nishadraj, Shringverpur has a temple of Shringi Rishi, reveled from excavation. There is “Ram Chaura”, where Rama is said to have stayed overnight. Nishadraj has washed his feet, before taking the Lord in his boat. Lakshagriha: Lakshagriha is situated 45 km from Allahabad. Presently a big Mount, according to legend, it was originally made of lac to burn the Pandava brothers of the epic Mahabharata. Kaushambi: Kaushambi is situtated 60 km from Allahabad. The erstwhile capital of the Vatsa Kingdom, believed to have been ruled by King Udayan. Kaushambi, however, was also a great centre of Buddhism and Jainism. Ashokan column, Ghosita Ram Vihar, Syen Chiti and a ruined palace are some of the archaeological remains. Also there is a Digamber Jain Temple here. Rest house and Jain dharamashala are available for stay. Kara: Kara is situated 69 km away from Allahabad. The holy temple of Kara Dev on the banks of Ganga, lends this place its name. Once the Capital ofMughals, Kara’s ruins extend 3.5 km. along Ganga. 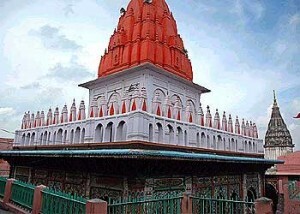 Kara Devi Temple, Samadhi of Sant Maluk Das, mound of Jai Chand’s Fort, Jama Masjid, Kshartrapal Bhairav Temple, Hanuman Temple, Kaleshwar Mahadev Temple, Khwaja Karak’s Dargah and Shivala Maharishi Ashram are other attractions. Sita Marhi: Sita Marhi is situated 72 km away of Allahabad. A sleepy village, Sita Marhi is where Sita stayed during exile at Sage Valmiki’s Ashram, Lav and Kush, her two sons, were born here. This entry was posted in Allahabad, Uttar Pradesh and tagged Historical Place. Bookmark the permalink.